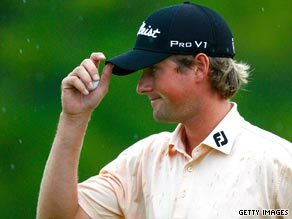 American rookie Webb Simpson took a two-shot lead at the halfway stage of the Barclays Classic Fedex Play-off tournament as world No. 1 Tiger Woods again struggled in difficult conditions at Liberty National on Friday. The 24-year-old Simpson, who has missed 10 cuts in his last 19 starts on the PGA Tour, carded a three-under-par 68 in his second round to be on eight-under 134 in New Jersey. He had started the day one shot behind joint leaders Sergio Garcia, Steve Marino and Paul Goydos, with the latter two Americans dropping back to second equal at the 36-hole stage after both carded 71. Spaniard Garcia slumped to equal 11th after registering six bogeys in a disastrous 76 as Tropical Storm Danny made its presence known — with the result being that the start of the third round was delayed due to the threat of heavy rain. Woods, seeking to bounce back after being surprisingly beaten to the U.S. PGA Championship title by Korean Y. E. Yang, followed up his opening 70 with a 72 as he dropped a shot at the 18th hole for his third bogey of a disappointing day. The American was tied for 17th in a group of 12 players including Irishman Padraig Harrington (75), Canadian Mike Weir (71), Jim Furyk (73), British Open champion Stewart Cink (72), 2007 Masters winner Zach Johnson (72) and Englishman Luke Donald. Donald was one of only four players to break par, shooting 69, while former world No. 1 Ernie Els went one shot better to leap up from equal 57th to a tie for ninth with American Charley Hoffman (74) on 140. Sweden’s Fredrik Jacobson and American Heath Slocum carded 72s to be four shots behind Simpson on 138, while Steve Stricker (70) was tied for sixth with England’s Ian Poulter (72) and Sweden’s Richard S. Johnson (71). World No. 2 Phil Mickelson was tied for 44th in a group of 12 players on 145 after a second-round 75. Four-time Barclays winner and defending champion Vijay Singh missed the cut of 147 by three shots after carding a second successive 75, while fellow major winners Lucas Glover (81) and Angel Cabrera (80) also failed to qualify for the weekend rounds.